First-time travelers to New York may have a long list of things to see and do: visit the Statue of Liberty, see a Broadway show or go to a Yankees game. You should do all of these things. But also take time to enjoy New York's open spaces. Central Park is the biggie, but there are other patches of green throughout the city. The High Line is a park built on an elevated train track that stretches almost 1.5 miles along Manhattan's west side. The original elevated train track was opened in 1934 as part of an improvement project for the area's industrial district, including the Meat Packing District. Trains ran on the tracks until 1980. Although the initial plan was to demolish the tracks, a group of local residents advocated to earmark the space for public use. 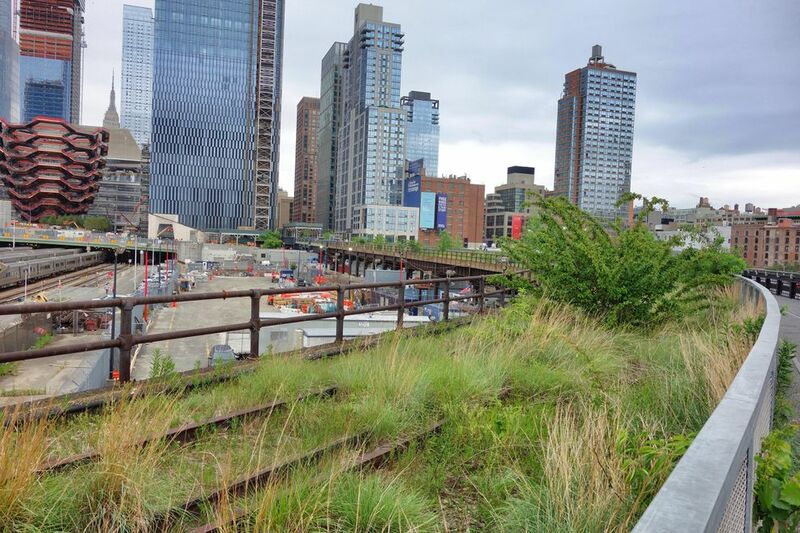 The group, "Friends of the High Line," worked with the city government to design the park. The first part opened in 2009. The northern end of the High Line is right across the street from the Jacob Javits convention center on 34th Street, near the Lincoln Tunnel. It's the only part of the old rail line at street level. All around the entrance, there are new high-rises being built. But the first part of the all-pedestrian path wraps around a huge railroad yard for the Long Island Railroad. I watched for about 15 minutes as the trains arrived and departed. All along the path, though, volunteers tend to the plants and open spaces. The landscape architects that work on the project are using many of the plants which grew during the 25 years that the tracks were idle. Walking above the Hudson Yards where the trains come and go also yields a great view of the Hudson River to the west. After the rail yards, the High Line heads due south through the Chelsea neighborhood. All along the path, you'll see remnants of the rail tracks, woven in between the patchwork gardens, benches and overlooks. There are several open areas and playgrounds for the kids. On the curve after the rail yards, you can look back and see the trestle-work and the wrought-iron railing. 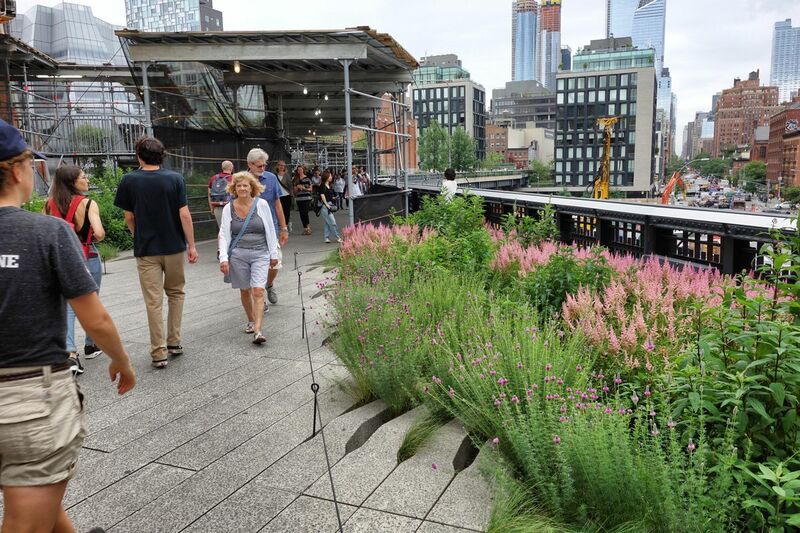 In addition to offering a lovely walk for visitors, the High Line provides a collection of venues for artists, for community gatherings, concerts and pop-up dining. Because the route of the tracks goes around and through several buildings, there are covered areas that are well-suited for gatherings. Although I missed the music concert, I spotted an ice cream sandwich vendor from a mile away! Next to them there were coffee stands and artists selling their wares. In addition to pop-up art shops, there are several spots along the way where local artists have painted murals on the walls, and there are sculptures on display. Walking above the Chelsea neighborhood, there are occasional signs on either side of the High Line to tempt you to come to ground level for shopping or dining. One of my favorite features is near the south end of the park. It's the Diller-von Furstenberg Sundeck and Water Feature. That's a long name to describe a collection of built-in lounge chairs, flanked by running water where you can sit and cool off your feet. Before you get to the lounge chairs, there's a little forest you walk through, called the Chelsea Thicket. It's easy to forget you're walking along an elevated railroad track — but just look down: the tracks are embedded in the walkway. Although the High Line is owned by the city, the Friends of the High Line raises 98 percent of the annual budget. They actively canvass for support, in order to develop an endowment for continued operation of the park. The "friends" are the non-profit caretakers of the High Line and manage all of the events and exhibits. Another open space in the heart of things is Battery Park, at the southern tip of Manhattan. This is where you catch the Staten Island Ferry and the ferry to Governor's Island. It's also where you catch the cruise to the Statue of Liberty and Ellis Island. I got there too late for the cruise, but enjoyed the beautiful views as I walked up to the September 11 Memorial. There's a museum here, but the open-air memorial at the site of the Twin Towers is free. It's a somber display, as the waterfalls flow from the original footprint of the towers to a hole in the ground. The names of those who died are inscribed around the borders of the two memorials. I didn't make it to the southern end of the High Line. Instead, I was lured down to street level for an espresso at Blue Bottle in the Meatpacking District. But that's another excuse to go for a stroll the next time I'm in New York.